Joyce McDavid Douglas, a longtime resident of Santa Barbara, died peacefully in her sleep on November 8, 2015 in Montara, CA. Her daughter Ara and son Alex were at her side. She was 94 years old. An exceptionally bright child, Joyce was skipped twice during elementary school and started high school at 12. An honors student throughout, she graduated from Lincoln (IL) Community High School, where she was a four-year member of the National Honor Society, the Debate Club, and spent three years on the staff of the school’s magazine, “The Railsplitter.” She was a charter member of the school’s chapter of the Quill and Scroll – an international honorary society for high school journalists, a three-year member of the Home Economics Club, and a four-year member of the Glee Club, for which she earned a varsity letter. Her post-HS interest was to go to college and study art and, although she was quite good at it, the idea was squashed, first by her father who thought it frivolous and then by the sudden obligation to run the household when her mother’s doctor ordered a year’s bedrest due to a weak heart. Three years later, she married for the first time and then attended Lincoln College for a year while he served abroad in World War II. Decades later she enrolled in several courses at Santa Barbara City College. Joyce, (AKA Mommy), first came to Santa Barbara with her two little girls in February 1953 to marry William A. “Bill” McDavid and adopt his three daughters. They were introduced by Joyce’s best friend who had worked as a housekeeper for Mr. McDavid while her own husband was stationed at Camp Cooke (now Vandenberg AFB). What started in June 1952 with a half-dozen letters of mutual interests and comradery, turned into a whirlwind courtship five months later when the military couple – passing through town again on their way to yet another assignment – told Bill that they thought he and Joyce should consider marriage. When he broached the idea, Joyce responded enthusiastically – and the letters increased exponentially. With the exception of two phone calls, one telegram, a couple of holiday cards, a birthday card, and an exchange of photos, the entire courtship took place via 128 handwritten letters. To make a long story short, by mid-February, Joyce had trained a replacement, put her little house on the market, shipped multiple boxes and, with her daughters in tow, boarded the train to meet her husband-to-be and his daughters for the first time. Arriving on a Thursday, they were married on Saturday. Somewhere in his letters, Bill had said he hoped she had a sense of adventure. Little did she know how soon the next one would come. The following January, thanks to a promising job offer, they all moved to a tiny two-bedroom house in Kodiak, Alaska! And then, only eight months later, due to a problematic work environment and promising new offer, they moved to Alton, Illinois. That adventure, which included the birth of their son, lasted a year-and-a-half, before they returned to Santa Barbara in May 1956. While in Alton they learned that the erratic boss in Alaska had died from a brain tumor and then, back in Santa Barbara, they learned that the struggling small college in Alton had gone bankrupt and closed. An accomplished and award-winning poet, Joyce was a longtime member of the California Federation of Chaparral Poets. She won their first place award in 1971 for her poem, “Sunflower.” In 1986, she won their Roadrunner-Up trophy for “Ariana at Eighteen.” She was also published in the Christian Science Monitor and Capper’s Weekly, among many others. In addition, she wrote hundreds of poems acknowledging or honoring family and friends on special occasions. A member of the First Christian Church of Santa Barbara for nearly 60 years, she served in almost every role available including alto in the choir, elder, historian, Poet Laureate, and Sunday school teacher. 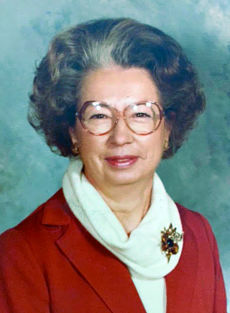 Professionally, she held numerous jobs, eventually retiring in 1983 after 18 years as a secretary within the district offices of the Goleta Union School District. After Bill McDavid died in 1973, Joyce started a new adventure when she met and fell in love with another native son, Walt Douglas. They wed in 1975 and were married for just shy of 39 years. During that time they were active in many groups and activities including The Westerners and the Arlington Theater Organ restoration. The oldest child of Carl W. Smith, a WWI marine who became a school teacher and principal, and the former Leota Mae Gibbs, a lifelong member of the Women’s Christian Temperance Union (WCTU), Joyce is survived by her sister, Madeline Arenson, daughters Ehrin Abram, Ara McDavid Fancher Croce (Rich), Marianne Daughety, Marcia McDavid, and son Alex McDavid, as well as Walt’s children Dudley, Aaron (Darlene), and Jena Douglas. She also loved and leaves a cornucopia of grandchildren, a plethora of great-grandchildren, three great-great-grandchildren, and a bounty of nieces and nephews. She was preceded in death by her husbands, William A. McDavid and Walter C. Douglas, her brother Carl Smith Jr., daughter Cathy McDavid Barrett, granddaughter Tomi Bortolazzo, and stepdaughter Kim Douglas. A memorial service will be held at 2:00 p.m. on Saturday, January 9, 2016, at the First Christian Church, 1915 Chapala St., Santa Barbara, CA. A reception will follow at Harry’s Plaza Café. In lieu of flowers, the family asks that donations be made to either the Memorial Fund at the First Christian Church, or to her hospice provider, Pathways Health, by using the online option at pathwayshealth.org or by printing out the donor form on the website and sending it to Pathways Foundation, 585 N. Mary Ave., Sunnyvale, CA 94085.